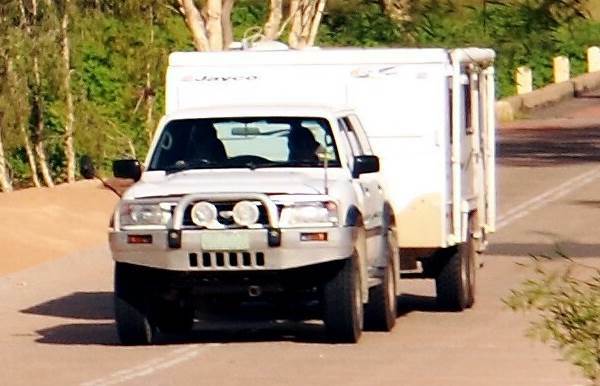 Are you permitted to tow a caravan with a person riding in the caravan? Are you permitted to tow a caravan with a person riding in the caravan? Correct. Caravans are not designed to be crash-proof. A person in an accident in a caravan is likely to be seriously injured or worse. A caravan is a fairly lightweight trailer and when you pack it you should ensure that heavy items are located centrally, low down with the centre of weight just in front of the axle. The caravan will be subjected to the same forces that the car is subjected to. When you brake, items will want to shift forward, and when you accelerate they'll want to shift backwards because of inertia. Around corners they will want to move towards the outside of the bend due to this inertia and will be held in place party because of centripetal force exerted by the friction of the object they are sitting on or resting against. Caravans are built so that doors and drawers don't come open under these scenarios, but other objects in the caravan can still move about. As regards additional weight in the caravan, it can destabilise it. People should not ride in a caravan not only because of this destabilisation that could occur, but also because a caravan provides next to no protection in a crash. There are no seat belts or air bags and the caravan itself will be made from material that is not crash resistant - basically light aluminium, plastic, plywood and fibreglass on a chassis. Add to this the potential for other items in the caravan to become destructive or fatal missiles in a crash, from the knives in the drawers to a large heavy gas cylinder, and you can see the risks. Therefore having a person riding in a caravan on a public road is against the law. Also see our guide to towing a caravan here.